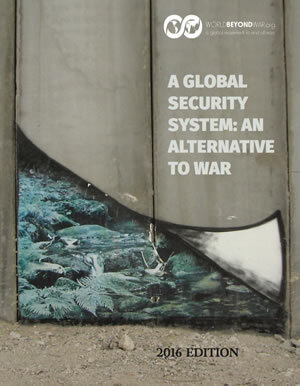 "A Global Security System: An Alternative to War" - 2016 Edition Now Available - World Beyond War . . .
To get the new 2017 edition, sign up and attend #NoWar2017. To use the new online study and action guide, click here: Study War No More! * Why is an Alternative Global Security System both Desirable and Necessary? This report is based on the work of many experts in international relations and peace studies and on the experience of many activists. It is intended to be an evolving plan as we gain more and more experience. The historic end of war is now possible if we muster the will to act and so save ourselves and the planet from ever greater catastrophe. World Beyond War firmly believes that we can do this. Available at your local bookstore or any online bookseller. The distributor is Ingram. The ISBN is 978-0-9980859-1-3. Buy online at Amazon, or Barnes and Noble. Or buy in bulk for a discount here. The 2016 edition was improved and expanded by World Beyond War staff and Coordinating Committee members, led by Patrick Hiller, with input from Russ Faure-Brac, Alice Slater, Mel Duncan, Colin Archer, John Horgan, David Hartsough, Leah Bolger, Robert Irwin, Joe Scarry, Mary DeCamp, Susan Lain Harris, Catherine Mullaugh, Margaret Pecoraro, Jewell Starsinger, Benjamin Urmston, Ronald Glossop, Robert Burrowes, Linda Swanson. The original 2015 edition was the work of the World Beyond War Strategy Committee with input from the Coordinating Committee. All active members of those committees were involved and get credit, along with allies consulted and the work of all those drawn from and cited in the book. Kent Shifferd was the lead author. Also involved were Alice Slater, Bob Irwin, David Hartsough, Patrick Hiller, Paloma Ayala Vela, David Swanson, Joe Scarry. Patrick Hiller did final editing in 2015 and 2016. Paloma Ayala Vela did layout in 2015 and 2016. Joe Scarry did web-design and publication in 2015. I support your cause and look forward to reading this book. There are places to discuss this book in comments under each separate section, but general comments and questions and concerns about things that are perhaps missing and should be added can go here on this page. Also general ideas on promoting awareness of this document could go here. Thank you for spreading this concept. What we don’t talk about, we don’t think about. 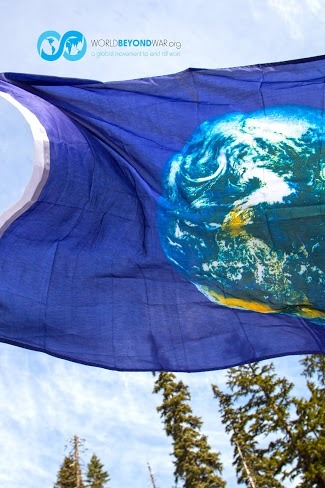 More power to you and all who are working for a peaceful, just world. Of course it sounds like a great Idea to get rid of war, but as the saying goes: “Politics is war without guns, War is politics with guns”. My real question is, how do you expect to convince an entire corrupt industrial military complex that absolutely refuses to do anything good? The same industrial military complex that is currently feeding the world CancerFood and saying that it is safe. They aren’t going to see a good idea and just go with it, these so-called “people” in the industry go out of their way to destroy what is good and reinforce what is bad so they can make more value-less profits. That is the real obstacle in the way, the entire corrupt industry backed system that is profit-minded and seems to care not about this world or the life on it. How will you convince a bunch of corrupt corporate goons to stop poisoning the world, stop manufacturing weapons, explosives, bullets, etc. Even if you convinced the corrupt system of the US, you have other nations which have no interest in getting rid of their self-defense mechanisms. In my perspective, the only way to get rid of war for good is to get rid of all humans for good. We all need to stop these religious wars now!!! Many years ago my husband and I did presentations through the group Beyond War. I don’t know if you folks are related but everything you have here is quite familiar. Including many of the questions by those who have read through your material. The question, “How can we possibly move beyond war?” seems as though it doesn’t have a plausible response. But in fact an idea once it becomes embedded in a society can create enormous change. We used to apply a 20% bow wave graphic to aid people in visualizing that swell of change moving into the society. Are we now beyond war? Of course we aren’t but we must bend all efforts to head in that direction because although wars still plague all of life, we cannot use them to effectively and sanely resolve conflicts. That is where we find ourselves at this time. A world beyond war is worth every possible effort. No one person or group has all the answers to nagging questions of how it is going to happen or how long it will take or any number of other worrisome problems that seem insurmountable. All those issues and concerns need all of us to work together to build a world beyond war. It appears that I have made three contributions to WBW. I have only received a receipt for one. One is all that I want counted toward my credit card. I want only 10 books. I had problems trying to make this contribution twice before it seemed to go through but it says I made three contribution. Will you please take care of fixing this? I have been a member of Veterans for Peace for about 17 years. 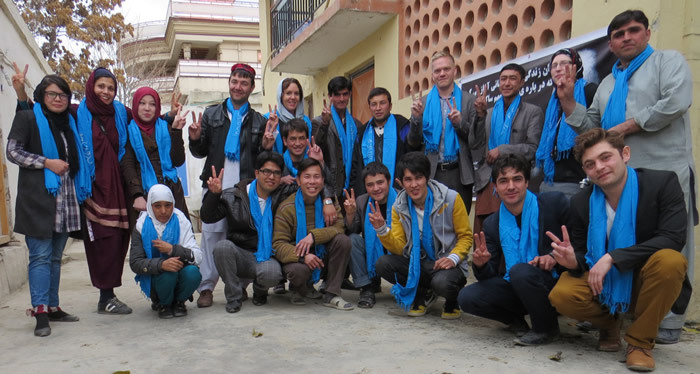 Are you aware of VFP and our efforts to stop Iraq I and II and in Afghanistan. Please take a look at the VFP website. Remember the protests in D.C.? We stand on Peace Corners across the nation. Join us in Chippewa Falls, WI every Saturday morning at 1100 hours. I haven’t read the book. But a global security system sounds like a New World Order. If the current shadow government runs this thing then the dictatorship they desire will be in their lap. The people do not govern themselves and moving towards that is the first step, not a global security state that will inevitably be run by the psychopaths already suggesting that solution. All major wars are started by governments and paid for mostly by civillians via taxation and with their lives. Not even the hundred richest corporations in the world would be capable of maintaining warfare for longer than a year without going bankrupt nor would they find the number of staff willing to die for them. If we want to end war we will have to stop believing in (the necessity of) a ruling class which acts on behalf of all of us and forces us to pay for their decisions and interests. 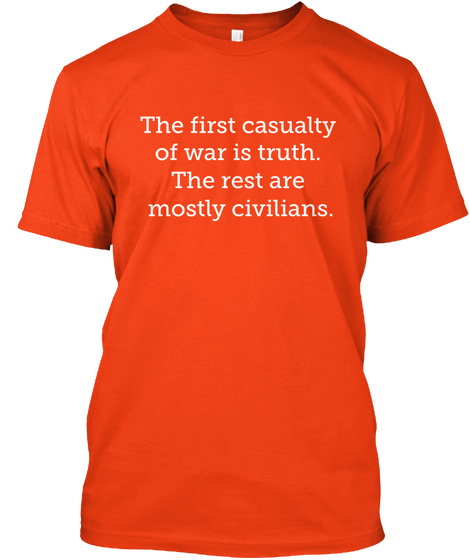 War is not a lie, the power of government is. No government, no taxation, no war. I’m all for a world without war. However, having a military as defense is not the same thing as war, and the world is not a yet a civilized place where we can give up military defenses. Also, why isn’t this group active in Israel? Israel, the banksters (largely aligned with or loyal to Israel), and the Israel lobby are three of the biggest factors in the type of imperialism WBW seems to be against. “EPUB is an e-book file format with the extension .epub that can be downloaded and read on devices like smartphones, tablets, computers, or e-readers.” You can probably find an ePub reader for your old Mac, but you’re probably better to download the PDF version since almost every platform has a PDF reader–but without knowing what version of “old mac” you have I can’t guarantee that for yours. You can download a PDF reader from adobe.com. Please ask again with more details if this doesn’t work for you. I am looking forward to read the book. The main conclusion I came to about the climate change thread and our disability to meet this real terrifying threat with adequate means is, that we will not be able until we finite the great inequality which still exist inside our countries, between our countries and continents, regarding wealth, power, influence and education. Otherwise the different strength of power and interest will always follow its own interest and there will be always something else to do before. I am afraid, the same will come true for finding world peace. General Darlington Smedley Butler was one of our most decorated soldiers with 2 medals of honor. He came to believe no war was worth fighting and wrote a book called ‘War is a Racket’ which is worth reading. He died in the 1930s before WWII. There was something called the business man’s coup to throw FDR out of office and he was approached about leading it. He turned them in. That’s a fascinating story. Einstein told us the most effective, enjoyable, easiest, and fastest way to create sustainable world peace and prevent the predictable human catastrophe: We require a newer way of thinking. Jack Canfield and Briand Tracy have endorsed http://www.peace.academy and http://www.worldpeace.academy which explains how we can create sustainable world peace in 3 years or less be teaching 7 simple word changes and 2 secret love-creation skills. All content is forever FREE to everyone, everywhere, any time. I loved reading your pdf – but – in a country where a person like d trump can reap as many votes as he has, what hope is there for intelligent thinking about war & peace. Its not Trump. Its the puppet masters who are there regardless of public figures. But I agree. Global Security equals Global Fascism without a revolution to change the status quo. I noticed that the 2015 edition was available in an ePub format file. Is the 2016 edition available in either ePub or Mobi formats? Either one of these would be easier to read on my Android tablet than the PDF version you offer (I converted that one to Mobi, but PDF is such a “terminal” format that it didn’t come out very well, and the indexing is totally non-functional). If you don’t have that format available already, I could probably do a conversion to either ePub or Mobi for you, but it might take a little time, and I wouldn’t want to reinvent the wheel of either format is already available. A follow-up too my earlier question (sice I never got an answer to it, and it may be irrelevant by now). I notice that you’re about to come out with a new 2017 edition of this book for the September “No War 2017” meeting. If you are not already planning to issue this in a standard e-book format (ePub or Mobi), could I help to get it to a wider distribution of readers by helping you convert it to one or both of these formats? Thanks for any information you can gime on this.